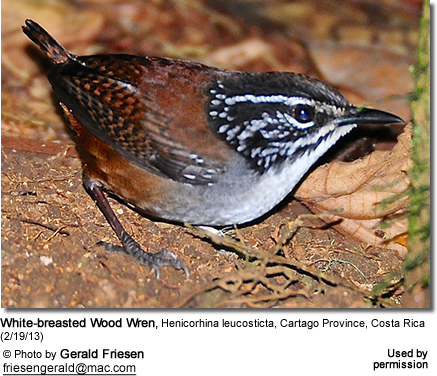 The White-breasted Wood Wrens (Henicorhina leucosticta) - also known as Lowland Wood Wrens - are small songbirds with a natural range that stretches from central Mexico south into South America to northeastern Peru and Surinam. They inhabit humid forests and adjacent second growth up to 6,070 feet (1,850 meters). They are typically seen in pairs or small family groups. Tropical and subtropical northern and northwestern Colombia (lower Cauca Valley, middle Magdalena Valley). Range: Eastern Panama and immediately adjacent northwestern Colombia. Upper Plumage / Head and Neck: chestnut brown upperparts with a darker crown, pale supercilia ("eye brow"), and black-and-white streaked sides of the head and neck. Wings and Tail: barred with black. Young birds have duller upperparts and grey underparts. White-breasted Wood Wrens feed on insects and other invertebrates. They forage on the ground or in low vegetation. These wrens construct roofed nest on the ground or very low in undergrowth in an area that is concealed by dense vegetation. These birds have been recorded to build "dormitory nests" for individuals or family groups that are usually placed at a higher location - up to 9.8 feet (3 meters) off the ground. A clutch consists of 2 - 4 eggs that are incubated by the female alone for about two weeks to hatching. The young fledge (leave the nest) when they are about two weeks old.